Below, we describe how to import orders to Magento 2 in the most natural way. The process is necessary for migrating from your old store to a Magento 2 website or transferring data from a connected marketplace. The Magento 2 ecosystem offers multiple order import extensions that simplified the way you move orders to your store, but the most fully-featured solution is the Improved Import & Export Magento 2 module. First of all, it provides the ability to import orders to Magento 2 using multiple file formats. Of course, it is possible to transfer data files via standard CSV. For instance, you can import orders to Magento 2 via CSV from your old Magento 1 website or other platforms that create the corresponding output. The second supported file format is XML. It is flexible and extremely popular among multiple e-commerce systems and tools. Feel free to use the Improved Import & Export Magento 2 extension to import orders to Magento 2 via XML. Besides, there is support for TXT files. If an external system generates order data in this format, the Improved Import & Export Magento 2 extension will quickly move all orders to your store. Another essential feature of the module is the ability to work with JSON files. With the full support for this format, you can easily import orders to Magento 2 via JSON. It allows simplifying the migration from Shopify to Magento 2. Besides, native Excel files are supported. Thus, you can run Magento 2 order import from XLS and XLSX sheets without any negative consequences. Furthermore, the Improved Import & Export Magento 2 extension is integrated with Google Sheets. Thus, you can avoid using data files to move information to your e-commerce store. Feel free to leverage the extension’s functionality to run orders import to Magento 2 right from Google Sheets. Order import would be incomplete without Magento 2 order export functionality. Export procedure allows you to get the sample file and understand how the orders can look in either CSV or XML. Let’s have a look at the order CSV table and understand how it is composed and how different order attributes behave. Learning how the file and attributes work will help you understand peculiarities of the import procedure. As per the sample above we can see that the orders are exported from the database preserving all attributes and values as they are stored in the DB. Orders are imported using both entity_id and increment_id attributes. entity_id – is an internal order identifier used by Magento 2 to get the place for the order in the database. Magento 2 assigns entity_id automatically depending on the IDs already in the database. If the imported order has the same ID as the order already at the store – Magento 2 will assign new ID to it automatically. The order is not represented in the order details screen. 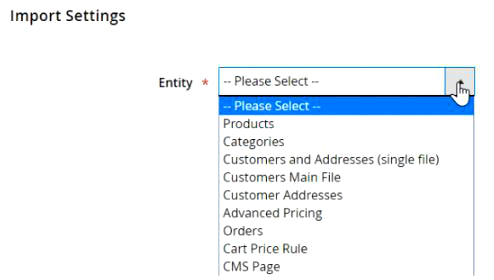 The only way to see it from the Magento 2 admin panel is to look at the order details screen URL. increment_id – is an actual order number, a unique order number that can be found in the order grid and in the invoice. The value is unique, two orders with the same increment ID cannot be processed by Magento 2. The products are assigned to orders using their SKUs. If the store doesn’t have a product with an SKU it is tied to, the imported order will still have a product reference. However, ‘reorder’ functionality will not be available. The customers are assigned to orders using their email addresses. If the store doesn’t have a customer with an email it is tied to, the imported order will still have customer details. However, such customers will be listed as guests. Both Magento 2 Community (Open Source) and Enterprise (Commerce) edition order tables can be imported into each other. Magento 2 Commerce has gift card and reward point attributes, however Magento 2 Open Source ignores them, so you can import Commerce orders into Magento Open Source without any issues. Improved Import and Export extension allows to both export orders from Magento 2 and import orders. If you want to transfer the order history from one Magento 2 instance to another read Improved Import and Export extension manual. If the aforementioned features are not enough for importing orders to Magento 2 in your particular case, we have a trump card. The Improved Import & Export extension supports orders import to Magento 2 via REST API. It connects to the REST API of the specified platform, gets all the necessary information, and moves it to the appropriate backend section of your store. Everything works seamless and with the minimum external interaction. You cannot find a tool that supports a more extensive range of file formats. Therefore, the Improved Import & Export Magento 2 extension provides the highest possible connectivity in the whole ecosystem allowing you to import orders from every external system without any headaches. But what about issues caused by different standards applied to data files? The Improved Import & Export Magento 2 extension allows you to prevent them due to the extensive mapping interface. Since every system has its attribute standards, you cannot import the external order file to Magento 2 without matching the third-party order attributes to the corresponding internal attributes of your e-commerce store. Luckily, the Improved Import & Export Magento 2 module allows creating a mapping scheme right in the backend so that you don’t need to edit data files manually. It is especially useful in case of the Magento 2 marketplace synchronization that provides order data files on a regular basis. Instead of matching attributes of the external platform to default order attributes of Magento 2 before every import, you create a mapping scheme only once. Next, the module applies it automatically when you import orders to Magento 2. Another vital aspect of orders import to Magento 2 with the Improved Import & Export extension is the ability to automate data updates. In case you are synchronizing Magento 2 with an external marketplace, this feature will help you save a plethora of time. Create any custom schedule for Magento 2 orders import using the standard cron syntax. Alternatively, you can select a predefined interval. Note that the selected range can be customized according to your business needs. Thus, the Improved Import & Export extension enables you to create a new import profile that transfer orders to Magento 2 automatically matching external order attributes to native requirements without external help. In case of one-time data migration, you can create a profile that can be launched only manually and still use the extensive mapping interface. Also, note that the Improved Import & Export Magento 2 extension provides the ability to apply mapping presets. Being predefined mapping schemes, they essentially simplify the order import process since you can match all external order attributes to internal Magento 2 rules in just a few clicks. Our team is working hard to create as many presets as possible, but we recommend you to contact support regarding the mapping schemes you need. The following gif image illustrates the simplicity of the process. To find more information about the Improved Import & Export Magento 2 extension, follow the link below. Contact our support team regarding any inquiries related to the order import functionality of the module and other extension’s features.